As one of the world's most popular indoor plants, the Golden cane or Areca Palm hardly needs an introduction. Outdoors, the Areca Palm quickly develops into an elegant, midsized palm with densely clustering, slender, green trunks; yellow crownshafts and leafstalks; and recurving, V-shaped leaves. The Areca Palm will tolerate cool conditions to some extent, as well as light frosts, and is best suited to climates ranging from subtropical to tropical. 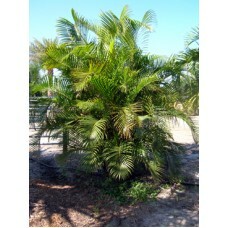 As one of the world's most popular Hedging Palms, the Golden Cane or Areca Palm hardly needs an..